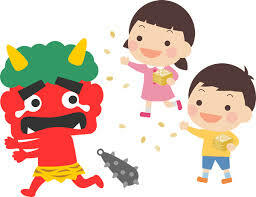 This Sunday is Setsubun – What is Setsubun? Setsubun literally means “division of seasons.” It is used to mark the end of winter and summer, and is derived from the old lunar calendar.. 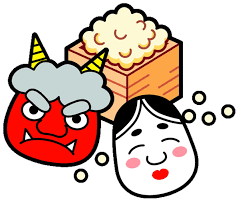 However, “setsubun” has now come to mean the day before the first day of spring only. It usually occurs around February 3rd. On this day, in a custom called mame-maki, people throw and scatter roasted soy beans inside and outside their houses while saying, “Out with the devil! In with good fortune”. Once the beans are thrown, gather them all up and eat the same number of beans as your age. Eat one extra to keep you from sickness and stay healthy for the whole year. 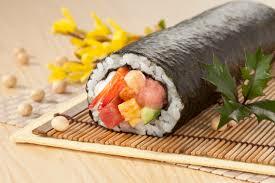 Ehomaki is a sushi roll that is believed to be good luck when eaten on Setsubun day. This custom began in the Kansai area but now it has become a nationwide event and Ehomaki is sold at supermarkets and convenience stores. When eating Ehomaki, look in the year’s good luck direction, and eat quietly while making a wish. This year 2018 direction is ESE.